We are nowadays hearing more and more about companies diving into the smartwatch area with most of them opting for the newly announced Android Wear platform for smartwatches. Now LG has also joined the race. According to LG’s official website, company has planned to launch the G Watch which was in development since the last two years. It will be using the Android Wear operating system. With current smartwatches the pressing issue is of power efficiency, as size constraints leave little room for a decent-sized battery. What makes this smartwatch stand apart from rest of the crowd is its ability to keep the screen always on. In fact, LG is promising that the screen will never go to sleep even when you are sleeping or if the watch is lying still on your side table. This quality alone makes this watch a solid contender in the current market of smartwatches. As when using current smartwatches like the recently announced Samsung Galaxy Gear 2 user has to tap on the display or move the arm to get the display back to life. Another thing to look forward to from G Watch is its ability to protect itself from water and dust. Smartwatches still do skip on this feature and users have to pay the price afterwards. G Watch will support voice functionality i.e. users will be able to initiate voice commands by simply speaking “OK Google”. 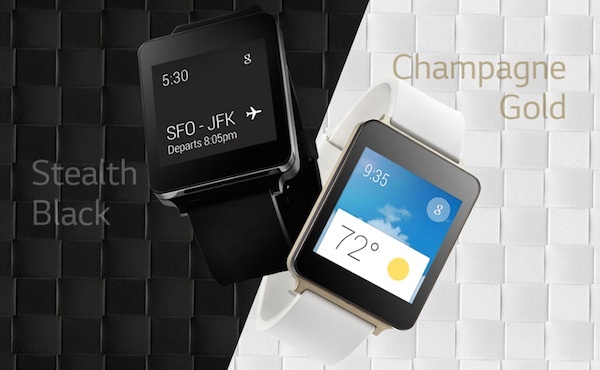 LG wants the G Watch to reach as many developers as it can. Therefore, it will be offered at a competitive price point. The smartwatch will be available starting this summer. From the start, there will be two color options: “stealth black” or “champagne gold,” both with plain rubber strap and slab-like faces that are meant to look “timeless”.